We can’t stop a child’s pain and needless disability if that child is hidden away. Find a child and start a journey of hope and healing. Denis was neglected by his natural father. Kept out of school. Bullied by neighbourhood kids. All because his legs bowed badly outwards. If his sister, Roy, hadn’t rescued him – taking Denis as part of her family – his life would have continued to waste away. Despite being loved desperately by his sister and her family – desperate poverty still kept Denis from the healing care that would make his legs straight and strong, not knowing there was a solution. There are millions of children like Denis in our world. Trapped in the world’s poorest villages and slums by poverty and disability, with no hope of healing or rescue. When you help us find a child – you give families hope that there can be better life for their child. You begin a child’s journey of healing. Denis healing journey began the day Agnes, a Hope and Healing International Community worker, found him at a mobile outreach clinic. That day, Denis learned that there was hope his legs could be fixed. A mobile clinic is set up in a school, church, or local health facility and promoted throughout the community. Parents bring children with a disability to these clinics and children needing care are referred to Hope and Healing International’s partner hospitals or rehabilitation programs. Community workers travel long distances by bike and by foot, going door to door – talking to village elders, and neighbours to see if they know of any children with disabilities. These passionate community workers are the heart of our work – defending children who live with disabilities against those who write these kids off as useless and cursed. In the battle to have children with disabilities valued as they should be, these devoted men and women are on the front lines. Posters at local clinics and radio ads playing on local stations alert family members and friends to the hope Hope and Healing International offers. The good news is passed on to the people who need it. – Agnes, the Hope and Healing International community worker who found Denis at a mobile outreach clinic. 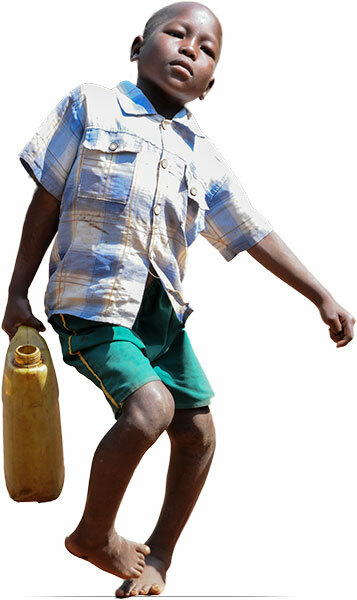 Help a child like Denis take a first step towards hope and healing. What happens after a child is found? We give them a healing hug.